Walking between the Abbaye aux Hommes and the Abbey aux Dames I passed through Place Saint-Sauveur. Not only is this square one of the oldest public spaces in Caen, it is also a fine example of urban classicism. Fortunately it was not heavily destroyed during World War II. Besides the striking architecture in the area, you will not miss the prominently placed statue of Louis XIV of France, intriguingly dressed as a Roman Emperor. Louis XIV as Roman Emperor by French sculptor Louis Messidor Petitot, 1828. The allusion to a Roman Emperor is unmistakable. Compare the statue in the photograph above to the torso of an unknown Roman Emperor in the Art Institute of Chicago. The King is wearing a decorated breastplate or cuirass. As with many portrayals of Roman Emperors, the breastplate is shaped to look like a bare, muscled chest. The king’s arms and legs are also toned, with reasonably shaped muscles. These are Classical references to the physical strength of the man. The dress also includes two rows of decorated, leather flaps hanging off the cuirass. And, flexible, leather straps cover what is usually a woollen tunic. Unlike some statues of Roman Emperors, Augustus of Prima Porta for example, the King is not barefoot. Many leaders of various European kingdoms or empires looked to the Classical world for elements they could use to bolster their own image; particularly in times when Neoclassicism was popular. 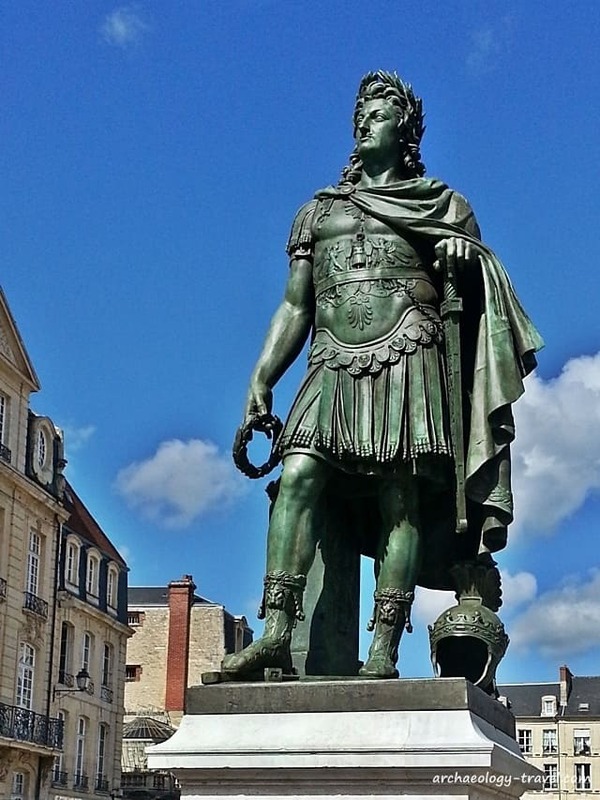 Apparently, Louis XIV fancied himself as a great military leader and admired Emperor Trajan. In fact, Louis was sometimes referred to as Trajan de France. Some scholars believe that the Neoclassical Palace of Versailles, Louis XIV’s creation, with its use of marble and many sculptured busts of Roman Emperors, was styled on what the French king thought a modern Roman Emperor’s residence should look like. ► Porte Saint-Denis in Paris – designed by François Blondel in 1672 it shows the king leading his troops across the Rhine and surrendering enemies. ► In the Salon de Venus at Versailles – a sculpture by Jean Warin 1671-72 portrays the king dressed as a Roman Emperor. Read more about the representation of Louis XIV on the Roman Art Lovers website. 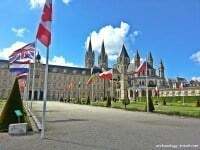 The Caen Memorial is perhaps the most popular tourist attraction in Caen. This World War Two museum styles itself as a centre for history ad peace, and attracts people from all over the World who are visiting the area to see the D Day Beaches. 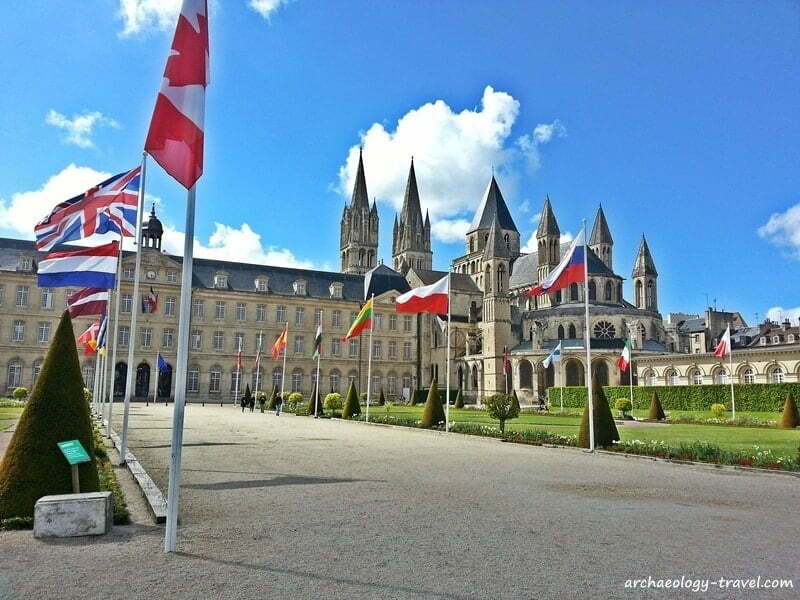 Besides the WW2 heritage in the city, Caen has a number of sites associated with William the Conqueror. Imposing walls of Caen Castle. 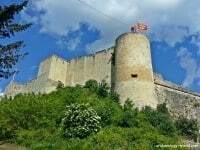 One of the largest fortified enclosures in Europe, Caen Castle was built by William Duke of Normandy in the 11th century. 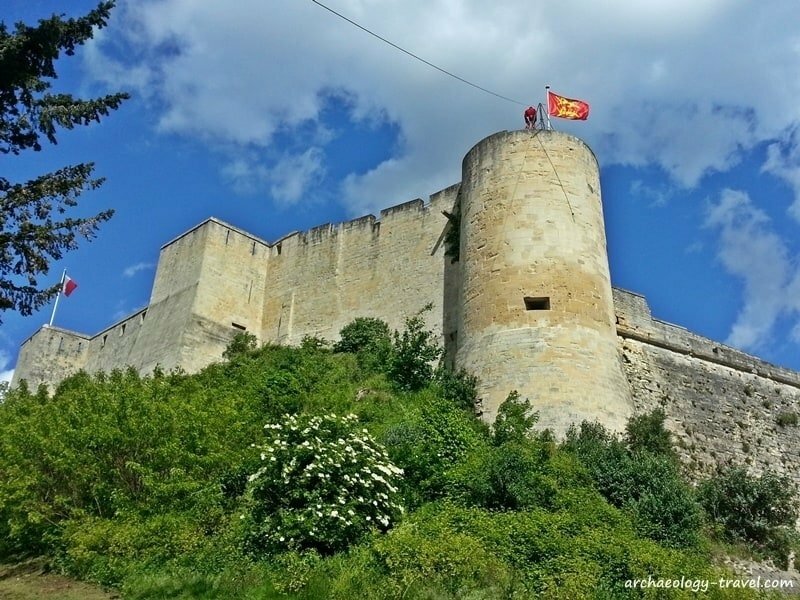 Originally the Duke’s residence, the structure has at other times been a fort and housed military barracks. Today two prestigious museums are sited within the walls of the castle: the Musée de Beaux Arts, which has one of the finest collections of 16th and 17th European paintings in France, and the Musée de Normandie with its exhibitions on the history of Normandy from the Stone Age to the more recent past. The Abbaye aux Hommes was founded by William the Conqueror in 1059 as a monastery for men, following his marriage to Mathilda of Flanders. 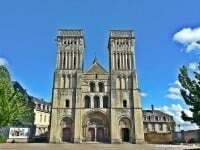 The Gothic abbey church is dedicated to Saint-Etienne, and has the tomb of the Duke of Normandy in the church’s choir. Much of the church is original 11th century, but the monastery was destroyed in the 16th century, and rebuilt in the 18th century. These buildings today house the Caen City Hall. Free guided tours of the Abbey complex are available daily. The Abbaye aux Dames was founded by Mathilda of Flanders as a monastery for women, following her marriage to the Duke of Normandy. 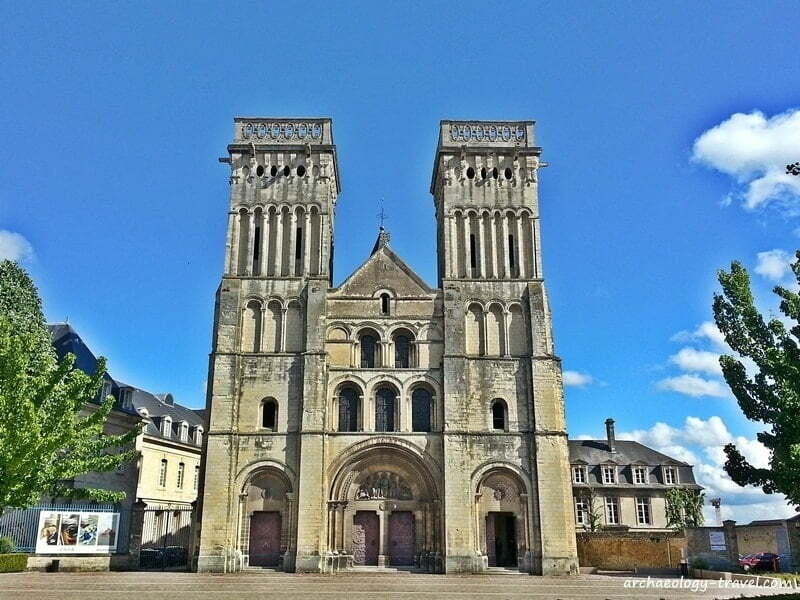 The Romanesque abbey church is dedicated to the Trinity, and in the choir is Mathilda’s tomb. In the ceiling of the apse is a restored but spectacular 18th century fresco that depicts the Assumption of the Virgin Mary. The original spires were destroyed in the ‘Hundred Years War’, and replaced in the 18th century, otherwise much of the church is original.